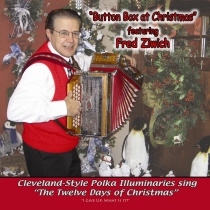 Christmas with the talented International Polka Music Hall of Fame® Fred Ziwich featuring the button box accordion! Fred Ziwich is one of talents of the US polka scene. Mr. Ziwich has led a group called the International Sound Machine (ISM) for years. Mr. Ziwich and the ISM are creative. He has won numerous awards on the button box accordion and this album will surely please many. He is an accomplished performer on many instruments! 3. I Give Up, What Is It?